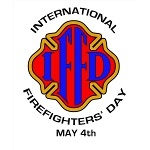 International Firefighters' Day (IFFD) is observed annually on May 4. It was created in 1999 to honor the memory of five firefighters who died in a wildfire in Australia. In December 1998, a large fire occurred in Linton, Australia. Firefighters had to call for mutual aid. Five firefighters from the Geelong West Fire Brigade were sent to help. When the wind suddenly changed direction, their truck was engulfed in flames. All five were killed. This tragic event inspired JJ Edmondson, a volunteer firefighter, to create an international day for recognizing and honoring the sacrifices made by firefighters all over the world. The date of May 4 was chosen because it is the feast day of Saint Florian, the patron saint of firefighters. One of the symbols of IFFD is the red and blue ribbon. These colors represent the elements firefighters have to work with – red for fire and blue for water. Coincidentally, red and blue are also globally recognized to represent emergency services. On IFFD, people are encouraged to honor the memory of the firefighters who died in the line of duty and show support and appreciation to the firefighters who protect the safety of people all over the world. This event celebrates not only firefighters, but everyone in the emergency services.